Oystercatcher's... A Seafood Smorgasbord Fit for A King! Oystercatcher&apos;s... A Seafood Smorgasbord Fit for A King! Good morning all! thank goodness it is Friday! With the weekend, let me put a bug in your ear about one of Tampa Bay&apos;s premier seafood restaurants! It had been a while since I was last at Oystercatcher&apos;s and the last time I was there was for lunch, so I was really looking forward to heading back over to test drive the dinner menu! Believe when I say that one of the best parts about Oystercatcher&apos;s is the view. Any seat in the house gives you a great view of the water, and there aren&apos;t many better places around to catch on one of our amazing sunsets! After a long day&apos;s work, I definitely felt the need to start off dinner with a little adult beverage, and as far as those go, you can’t make a better choice than the Sangria! I&apos;ve been lucky enough to sample sangria from all over the area and this is up there with the best I&apos;ve had, and possibly the best. That sangria was also a good tone setter for my first appetizer of the evening in the form of the Lobster Mac N Cheese! This dish is so delicious. Before I realized what happened, I had already eaten the entire bowl! Time flies when your scarfing down good food! Next was on to the entree, but before that the awesome I tried a chef&apos;s delight in the form of the tasty sampling of the Micro Crab and Lobster Spring Roll, which was delicious! 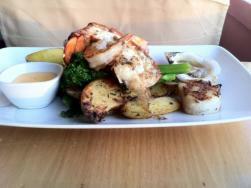 Now it was on to the entree, and I decided to check out the Seafood Mixed Grill! As you can see in the picture, it is quite an amazing dish, and believes me when I say the photo doesn&apos;t’t quite do it justice! Its like a buffet sitting at your fingertips in the form of scallops, lobster tails, shrimp, grilled veggies and fingerling potatoes! Better be ready for this one folks as it will make your tummy smile! Believe it or not, I actually did have room for some dessert and decided to give the Key lime pie a test run! The is one of the more famous dishes as I had been hearing about it from others for a while now. As you can imagine, I was pretty full after this, but it was truly a great meal, and ranks Oystercatcher&apos;s up there on my list of favorite restaurants. In addition to all of this was the great service and hospitality from the wait staff to truly make it a great experience! Be sure to stop by Oystercatcher&apos;s anytime and especially during Dine Tampa Bay Restaurant Week to sample their great menu for the event! To see photos of all of the food, feel free to check out our Facebook album! That&apos;s all for now, but stay tuned in for more Tampa Bay dining updates!